sammy officially turns 4 months old today. he really seems to be finding his own voice. usually with loud screams (mostly happy ones, thank goodness) and lots of laughing. i love hearing his laugh. so cute! 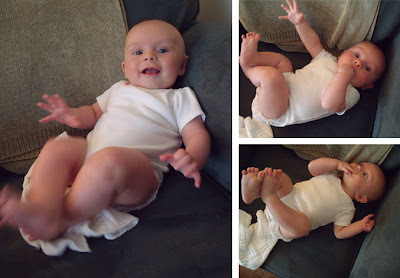 sam can anticipate a "getcha" and a tickling coming, and he'll laugh as soon as he sees the tickle fingers moving his way. he also does a lot of observing--hands, feet, lights, ceiling fans, and food (usually mom or dad's dinners) are all of great interest. he especially enjoys having people talk to him and will flash his "little sunshine" smile at just about anyone who tells him how cute or good or wonderful he is. this is probably why i get so many smiles. i tell him these things all the time. happy fourth monthaversary sammy! i love you to bits! ps - his four month doctor visit is monday, so stay tuned for his stats!